Tioman Island,which is 39km long and 12km wide, is a superb island located on the South East coast of Malaysia. With white sandy beaches surrounded by waterfalls, crystal clear water and dense tropical jungle, it is considered as one of the most beautiful and idyllic islands on Earth. 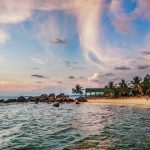 Tioman Island is a year-round destination meanwhile peak holidays for Singaporean and Malaysian are in November, December and Chinese New Year so the best time to visit would be in July and August when the weather is dry. There are two ways for getting to Tioman Island depending on your time and budget. The first is traveling by plane which is a very fast time-saving. 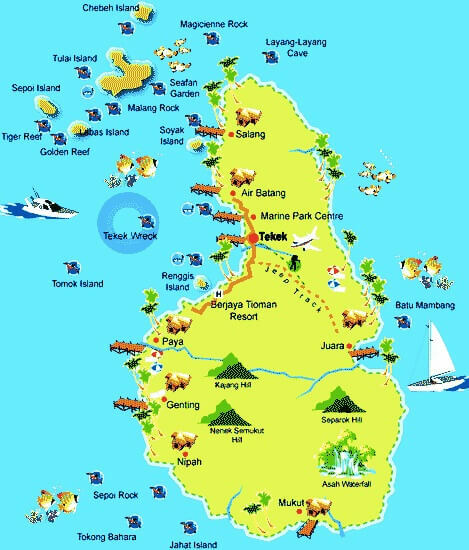 You can fly to a small airport on Tioman Island in Tekek village directly from Kuala Lumpur (Subang Airport, 60 minutes, RM225-$53) or Singapore (Changi Budget Terminal, 35 minutes, RM290-$68). The other way is transferring by boat from Mersing or Tanjung Gemok. You can either take the Bluewater Express ferry (RM35-$8) for 3 hours or a private boat for 2 hours (RM45-$11). They depart at regular intervals from 8:00 am to 4:00 pm. All boats will stop at different beaches and jetties of Tioman Island so just get out wherever you want. This natural wonder is perfect for family holidays as you will find plenty of options for comfortable accommodation and activities such as diving, snorkeling, fishing, surfing, shopping and hiking in the jungle. Trekking can be done from Tetek-the biggest village to Monkey Bay or Juara. You can also hire a jeep to go with the charge of about RM120 ($28) except for rainy days. If you want to turn your vacation into an adventure, just follow twisting jungle paths through a living rainforest, explore the sprawling root networks along a mangrove river and come face-to-face with the colorful marine life of the surrounding coral reefs. These are some of the exciting opportunities that await those who choose to venture beyond the resort. Tioman Island offers a lot of diving chances with more than 25 dive sites while scuba diving is the best option for night diving and macro underwater photography. For advanced divers, there are also more challenging dive sites offshore of the main island like Sovak Island or Tiger Reef where they can experience the marine life with a big school of fishes, turtles, sharks as well as the variety of colorful hard and soft coral. 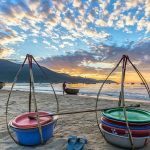 Besides, visitors can also take a trek through a traditional village to meet the friendly local inhabitants whose way of life has remained unchanged from the mainland. This wonderful island is attracting huge amount of visitors every year so the authentic beauty of Tioman can be affected. Be quick or you will be regretful! How To Transfer From Ho Chi Minh City To Phu Quoc Pearl Island?